Who Else Wants the Secrets That Will Pull Tons of Unclaimed Money From Your Website by Splicing These Simple But Dangerously Effective Video Tactics Into their Business? Not too long ago my buddy kidnapped me and took me to my first internet marketing seminar in Orlando, FL. On the drive down to Florida I confessed my towering dept from being a tech junky. ...if only we knew what was going to unfold for me on this spectacular weekend. A lot of powerful ideas filled the air, but no one seemed to be putting them together. Why are you NOT cashing in on the growing internet video buzz? I had some previous marketing experience offline and going to the seminar helped me learn something about myself. My first job was in a department store where I did fairly well on my commissions. I tried my talents out in a call center, yes I was one of those guys interrupting your dinner, but I couldnt close a single call. Why is talking face to face so important? Just watch ANY two people talking. People in general are very animated when we talk to each other. Your eyes, your mouth, and your movements all combine with your voice to say what you need to say. Can You Handle Getting Paid For A 30 Second Video Clip? * Generate tons of subscribers and add proven BUYERS to your list in record time! Have you spent many grueling painstaking hours, days, even weeks trying to write your own copy? Only to have it convert at a measly 1 or 2 percent? Or worse yet...had to pay several thousand dollars to get copy written with the same crappy results? Not anymore! Learn to make your website convert like crazy with simple, easy to create, cash generating video! While you cant make people read your sales letter, you can instantly peak their interest. You can tell them in seconds what would take a pages the old fashioned way. The V.I.P. Bonus! - A 1 hour intensive recorded Camtasia video I did with Keith Wellman about how he used video to maximize performance in his latest product The List FX and how he grossed over $103,000 in less than 7 days! * Hear how Keith used videos throughout his product launch to build a list of over 7,000 subscribers. * How he used video to build excitement and created a flood of traffic that crashed his server on launch day! * How you can use video testimonials correctly to double your conversions...do this wrong and you will see your conversions plummet! * Find out what Keith did and how you can duplicate him to add thousands of qualified buyers to your list in under 2 weeks! Ok, so it was not the worse day... Not even close! I spent the day building a special video set so that I could make the video that you see on the top of this page. And I recorded every minute of it. * If you order today you will also receive your bonus video of my interview of Keith Wellman where you will learn how Keith used video to build a huge list of buyers and subscribers in a very short amount of time. * Access to the un-released Video Equipment Selection Guide. With the guide you will also be able to share with me your thoughts and questions. And your thoughts may be included in the final release of this manual! * To make sure that you have the tools you need and help cut your cost.... I am also including a copy of FLVProducer. This is the program that I use for every video that I do.... Dont be burdened with hard to understand flash conversion any more. This software is a simple tool that will make your master pieces ready to publish in just minutes. 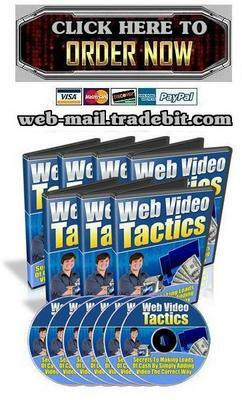 Order Web Video Tactics At An Incredibly Low Price Only $4.99!